For a long time, the image of young ladies with a conical palm leaf hat known in Vietnamse as “Non La” has become a symbol of Vietnamese charm and beauty. 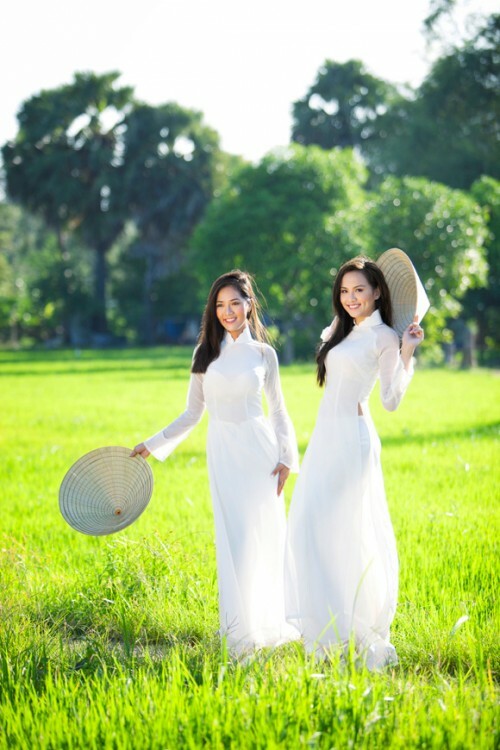 Along with Ao Dai, the Vietnamese traditional long dress, the hat stands for national costume identity now broadly recognizable around the world. Though appearing very fragile, Non La is in fact fairly strong as it is designed to withstand intense use and the impact of adverse weather conditions. In the tropical condition of Vietnam with plenty of sun and rain, Non La was a useful headgear to protect ancient Vietnamese from sun and rain. Besides, women can use Non La as a basket for when shopping in the market or a hand fan in hot summer days. Beside the practical purposes, it especially enhances the feminine grace when combined with Ao Dai – the Vietnamese long traditional dress. Up till now, the exact origin of Non La is still a question. However, the hat’s image was embossed on two Vietnam’s ancient artifacts such as bronze drums dating back 2500 - 3000 years ago. It indicates that Non La was already popular during this period, or perhaps even earlier. As a part of Vietnamese lifestyle, Non La has maintained its presence through all stages of war and peace of the country’s history. It is prominent in folklore as well as nowadays festivals. Non La is creatively hand-made from simple materials of nature including palm leaves for roofing and bamboo for frame. The hat’s outer surface is often covered by a layer of clear varnish to increase smoothness and water resistance. The making process requires experience, patience and skilled hands. Apparently, no machine is able to replace the traditional techniques inherited throughout generations of craftsmen to whom Non La making has been their livelihood. 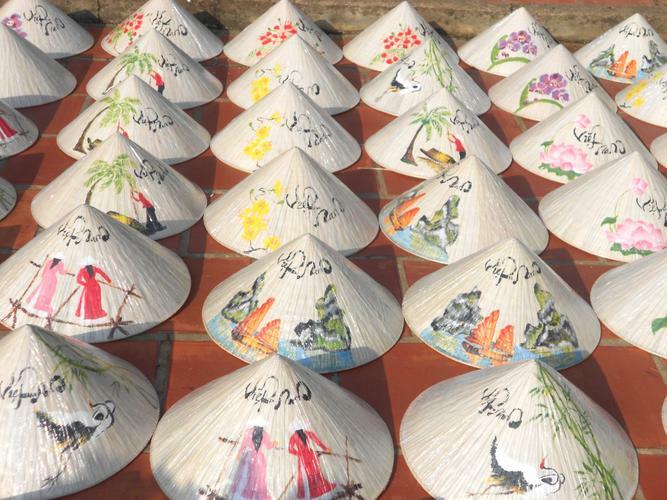 In addition to the original version, Non La has many variations such as Non Ngua (horse hat) from the coastal province of Binh Dinh in Central Vietnam or Non Quai Thao (flat palm hat) from a number of Northern provinces. Specific regions have their own ways of making their version of hat unique. However, it is commonly agreed among Vietnamese that the most beautiful variation of all is Non Bai Tho (poem hat), which is originated from Hue, the ancient capital of Vietnam, land of picturesque landscapes and famous poets. The decorative images such as the lotus blossom or the Buddha face are delicately imbedded between two layers of palm leaves and only visible in direct sunlight. There are many villages along Vietnam making Non la for a means of living. Chuong village in a suburban district of Hanoi named Thanh Oait the city’s center, is one well known location for its traditional hat making trade lasting through three centuries. Chuong villagers are very strict in selecting materials only sourcing the best from palm growing Northern provinces. The village produces thousands of hats per day for purposes of personal use, tourism souvenirs and export. The village is now a highlight of Vietnam day tours in the North for foreign tourists. A short drive from Hanoi will take tourists to Chuong village where they can enjoy discovering how Non La is made, listening to the stories of Non La’s history and learning more about Vietnam’s culture. After all, one thing they cannot afford to miss is taking back with them a hand-made Non La as a unique souvenir from Vietnam.